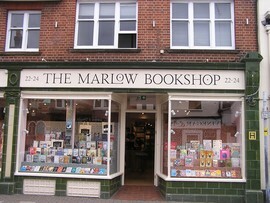 This morning I visited the newly opened Marlow Bookshop in Spittal Street to say, on behalf of the Society, how much I appreciated the new shop's façade and, in particular, the high quality signwriting on the shop sign. I am sure that we all wish the owners every success in their new venture. How refreshing it is to see a new company making such a positive impact on one of our historic streets. What a contrast to the previous tenant who painted over the green tiles with white gloss paint, swiftly removed after local protests.